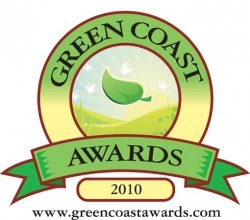 Voting has begun for the 2011 Fairfield County Green Coast Awards. Submit your vote for your favorite green business, organization or school. Winners will be announced at The Third Annual Green Faire, November 17th at the Stamford Marriott Hotel & Spa. Congratulations to Matt Turek who recently accepted the position as Director of the Green Coast Awards. Check out video of some of last year's winners HERE.